Polenta is a dish made from boiled cornmeal. The word "polenta" is borrowed into English from Italian. 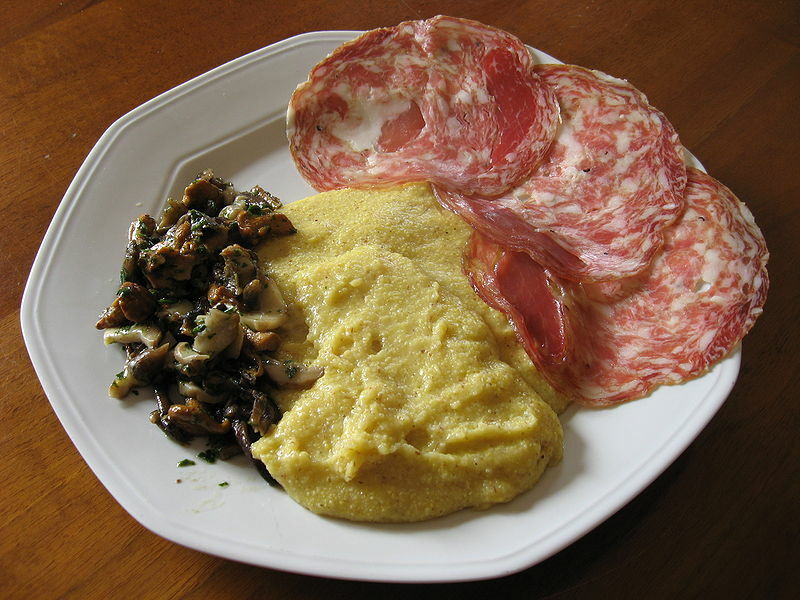 Left: Polenta with sopressa (a traditional Veneto sausage) and mushrooms. This polenta was made with yellow flour of Storo. Polenta is made with ground yellow or white cornmeal (ground maize) originally made with Chestnut meal in ancient times. It can be ground coarsely or finely depending on the region and the texture desired. As it is known today, polenta derives from earlier forms of grain mush (known as puls or pulmentum in Latin or more commonly as gruel or porridge) commonly eaten in Roman times and after. Early forms of polenta were made with such starches as the grain farro and chestnut flour, both of which are still used in small quantity today. When boiled, polenta has a smooth, creamy texture due to the gelatinization of starch in the grain, though it may not be completely homogeneous if a coarse grind or a particularly hard grain such as flint corn is used. 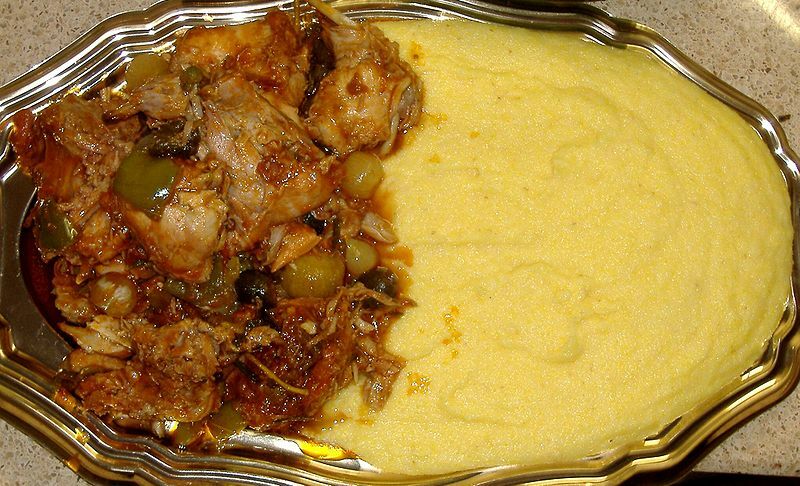 Polenta was originally and still is a peasant food. In the 1940s and 1950s polenta was not topped with luscious sauces but eaten with just a little salted anchovy or herring: nourishing and filling but on the whole dull. Since the late 20th century, polenta has become a premium product. Polenta dishes are on the menu in many high-end restaurants, and prepared polenta can be found in supermarkets at high prices. Many current polenta recipes have given new life to an essentially bland and simple food, enriching it with meat and mushrooms sauces, and adding vegetables, beans or various cheeses into the basic mixture. Polenta is often cooked in a huge copper pot known in Italian as paiolo. The variety of cereal used is usually yellow maize, but buckwheat, white maize or mixtures thereof are also used. Cooked polenta can also be shaped into balls, patties, or sticks and fried in oil until it is golden brown and crispy; this variety of polenta is called crostini di polenta or polenta fritta. This type of polenta became particularly popular in Southern Brazil as a consequence of Northern Italian immigration. Similarly, once formed into a shape it can also be grilled.